“Just wanted to let you know, went to an easy Bike Trail last weekend, didn’t need to use the assist at all and the bike was just a good bike. 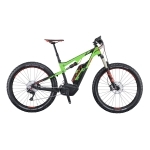 I have 10 quality Mountain Bikes from manufacturer’s such as Scott, Saracen, Trek, Mondraker, Whyte and Commencal, and this is one of the best even without the motor. I didn’t use the motor at all last weekend, but it’s like having a helper, you know it doesn’t matter what you come across because you have the backup. “One of the things I like about the e-bike community is that we seem to get a good number of reports of shops willing to go the extra mile or three in the name of looking after customers. I expect I am not the only one to have great, on-going, completely undeserved service from Martin and Mike at OnBike, but sometimes it’s worth noting it in public, since “thanks” won’t do on its own. A few weeks ago I took my trusty KTM Action Macina into the shop, as it had developed a crunchy noise emanating from the pedals, and swapping them out didn’t seem to help. It’s done 5.2K+ miles over two years, and the warranty – from another seller – is probably exhausted by now. Anyway, Martin put it up on the stand, stripped it back to the crank drive internals, and discovered the motor frame bolts needed some torque-wrench TLC. Twenty minutes later (during which I blinked greedily at the shiny toys in the showroom) it was all re-assembled, with not a squeak or a crunch to be heard in the house. Why double thanks? Well, ‘cos OnBike also organised a demo day the Sunday before last. I got to try a few new KTMs, a couple of fantastic Scotts, a bunch of Moustaches, two rather posh Riese & Mullers, and some BH Emotions too. Bundled with a good chat with product experts and fellow enthusiasts, it was a rather splendid day out, just for the cost of a train ticket. Even the rain agreed, and was good enough to hold off. Mark Holman, returning customer / 2nd eBike Purchase! “I bought a superb Ave XH-3 from OnBike in late 2012, whilst they were based at smaller premises in Hartlebury. Martin’s product knowledge and encouragement to test-ride a variety of MTB framed bikes really helped the decision-making process, and I ended up with a quality machine that is still going strong despite years of tough daily use. I’ve since added another Bosch bike to my collection, and despite having purchased that second-hand from elsewhere, Mike was more than happy to help with electronic adjustments and software updates – absolutely great support. Whenever I have people admire either bike, I now recommend they make the trip to the Worcester showroom to chat to the guys! “OnBike was a pleasure to deal with – they are the perfect combination of expertise and great customer service. They are warm, friendly and eager to talk about the bikes, to ensure that you are well informed before they send you off on a test ride. I can’t praise the chaps at OnBike highly enough!